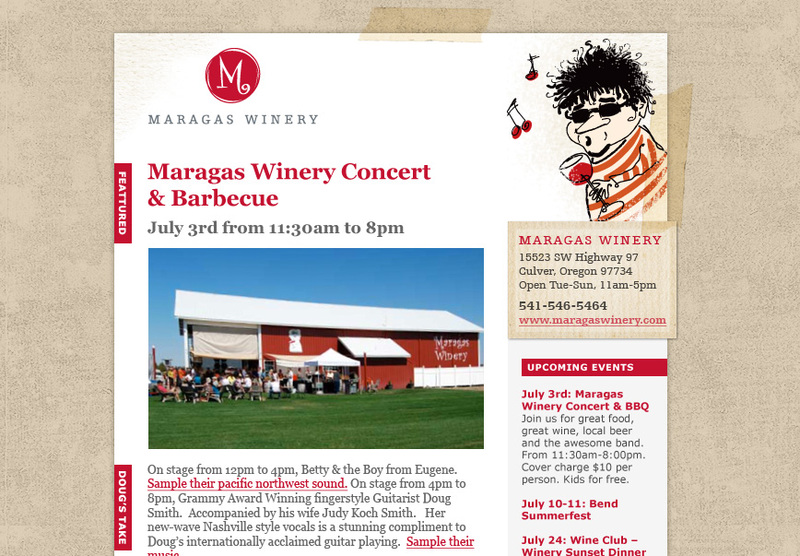 ​Maragas Winery is a Central Oregon winery that crafts high end, great tasting wine in a fun atmosphere with a hip and funky groove. The company was unique in every way, but they needed a brand identity that displayed their distinct persona. BACKGROUND: Maragas Winery is the first Central Oregon winery that produces nationally recognized award-winning wine, as well as offering extremely entertaining venues for fun events. PROBLEM: Central Oregon is not known for being a location for growing wine grapes, Maragas Winery has always had to explain that the Central Oregon region is actually comparable to California's wine country, and point out the fact of the many awards they've won for several varietals. Maragas Winery wanted to be taken as a winery that is serious about their wine. SOLUTION: Kinetic Branding created a brand strategy using brand energy, that focused on the deep emotional desires that wine connoisseur's are yearning for, instead of trying to explain that Central Oregon wine is just as good as any other wine. Click on any of the items below to read the details of each brand communication piece. The unique formula that Kinetic Branding identified for Maragas Winery is The Desire for Fun, The Desire to Belong and The Excitement of Discovery. Every human has many emotional desires, and these three emotional elements best represent the core desires found in Maragas Winery's audience. Entertainment is one of the most powerful human desires. We all love to have fun, especially people who love wine. Maragas Winery has two wonderful locations in Central Oregon, and they both revolve around an atmosphere of fun. The winery has a spectacular 360˚ view of the Cascade Mountain Range, a beautiful barn and patio. This venue is perfect for outdoor concerts and family-style barbeques. The downtown tasting room is also a groovy place to hang out. Everyone wants to belong to a group of people with similar interests, personalities and cultures. Maragas Winery offers people the chance to be a part of a unique group of people that love wine, People can become a member of the Maragas Winery Wine Club and get great discounts. Discovery is one of the main things that drives a wine consumer to select a bottle of wine that they've never had before. Most times, consumers pick a wine simply because the label is unique. This is because they are seeking an adventure to discover a new wine. Maragas Winery not only offers a unique taste to be discovered, but they offer two wonderful locations to discover a wonderful and rich wine tasting experience. The new corporate brandmark that Kinetic developed for Maragas Winery was based on the top three emotional elements. As with every projects, we make sure the clients' brand energy formula is clearly and consistently used in each and every brand communications piece. Keying off of the top emotional element of "Fun," Kinetic branding created a light-hearted and whimsical "M" emblem that symbolizes the character and atmosphere when visiting Maragas Winery's winery or tasting room. One of the ways we used the element of "Fun" was to key off of the 50's beatnik generation. Not only were the beatniks about fun, but they did it in style. While exhibiting fun is important, we decided to temper the fun, because the winery was a serious contender in the wine making business, and they needed to have a unique personality that could be respected in the wine making community. Maragas Winery had four initial varietals that they needed named and labeled. The company had created the previous varietals names, each based on various criteria, but none that were consistent or aligned in any one direction. Kinetic Branding decided that the names had to tap into the "Fun" element of the winery's unique brand energy formula, and that the labels would also add the emotional element of "Belonging" to work in conjunction with the "Fun" element. The names that Kinetic created were also based on the Beatnik personality that was emerging out of the research we had done into the family owned business. Each name needed to have a consistent beatnik theme, yet describe the uniqueness of the varietals. ​The final names, shown to the left, have significant meaning. "Swingin' Zin" not only spoke to the beatnik generation, but this varietals had a very spirited taste that literally knocked your socks off. It was an award-winning wine that people would literally start humming out loud with enjoyment and delight. "Poetic Pinot" was a nice sipping wine that soothed the soul. Reading and reciting poetry was a big deal, and the beatniks took a lot of time crafting poems. "Cheeky Chardonnay" was a term of sophistication, that also fits in with their Chardonnay. And finally, "Kool Kat Muscat" was the last name derived from the wine's refreshing taste. The new label designs created by Kinetic Branding were by far the most fun to design. The owner's mother had been an artist in the 50's and 60's and had a vast gallery of beatnik characters that she had drawn. 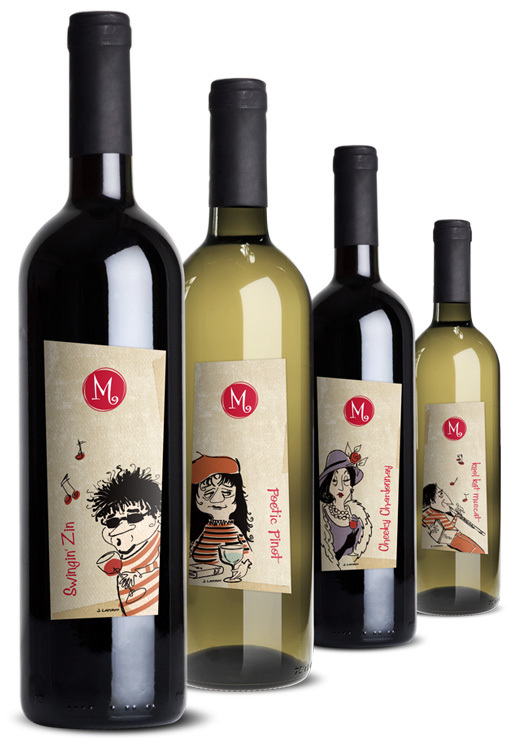 The beatnik characters shown to the left, have done the most to present Maragas Winery with a totally unique personality. No other winery had a beatnik theme. Kinetic scanned these priceless images into the computer and slightly upgraded the designs without loosing the integrity of the artist's style. 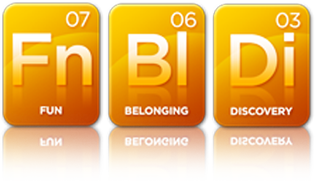 What emerged were extremely fun and likeable characters, that tapped into both the "Fun" and "Belonging" emotions. Each wine label is completely beatnik, with cool characters, a groovy name, and there are no square corners on the label itself. Think of football teams–their logos and their mascots. They inspire both fun and belonging. Everyone wants to wear their favorite team logo with the mascot proudly displayed in vibrant colors. The same is true with Maragas Winery's beatnik characters. They are cool, hip, groovy, far out, and just plain dy-no-mite. Each new wine developed by Maragas Winery is a new opportunity to introduce a new beatnik character pulled directly from the archives of the 50's and 60's. The new Maragas Winery website was designed to expand the overall brand identity based on the Emotional Elements of fun, belonging and discovery. The new design leans towards the discovery emotion, highlighting the winery's unique and stunning location in Central Oregon. 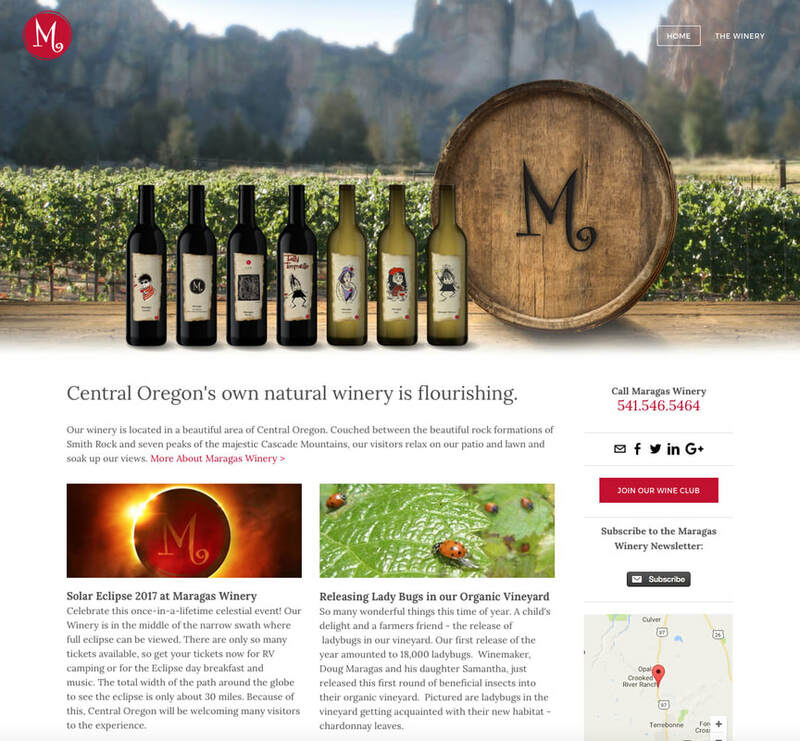 With amazing photography and the fun-focused wine labels, the new Maragas Winery website connects with consumers looking for a new experience. The website was built on our sister company's powerful content management system, allowing our clients the ability to quickly and easily update their website. Staying consistent with a groovy and hip style, even the company's monthly newsletter carries the beatnik characters and the off-beat look. The response to these emails are overwhelming. People love to receive the latest happenings from the winery, and even the copy is written in beatnik prose. As a result of this new email newsletter design, subscriptions have gone up almost 300% and the "email open rate" has gone from 15% to more than 50%.